The brains and beauties behind the wildly successful Glamazon app, Lisa Maree and Lauren Silvers. Time-strapped women (and men) looking for a last-minute manicure, hairdo or spray tan can now book and pay for services using Glamazon, an Uber-like app for beauty services which already has more than 10,000 users. 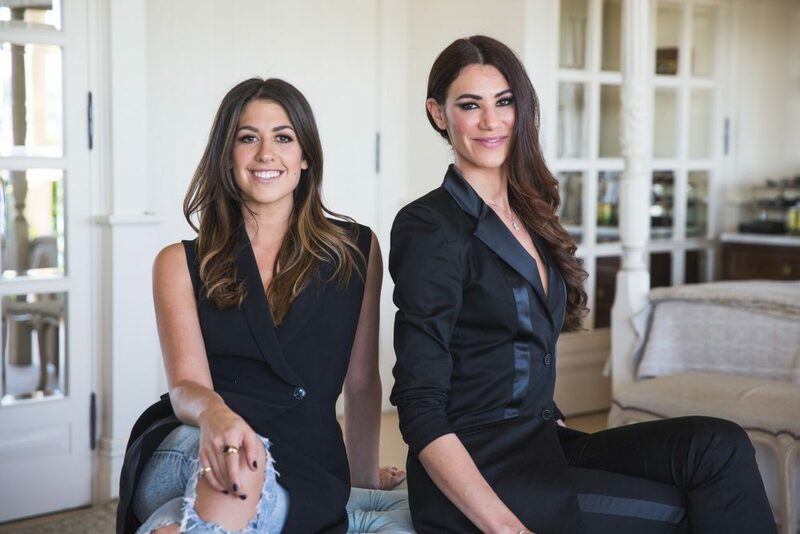 I recently had the chance to interview Bondi’s Lauren Silvers, 27, who founded Glamazon in 2014, before merging with GlamCrew and re-launching in late 2016. Glamazon is a beauty booking app which connects customers with freelance stylists and salons who are nearby (or able to come to your home or office) so you can access their next available appointment. Glamazon launched in 2014 where we connected customers with salon appointments then, after merging with Glam Crew – founded by Lisa Marie – we broadened to also connect our customers with freelance stylists. What made you decide to develop an app for beauty appointments? Coming from a background in Public Relations, I was constantly having to look respectable and presentable for events throughout the week. I was caught up in a meeting one day and needed to book a hair appointment. I searched “hairdresser Surry Hills” and called two salons, but neither having appointments available. I was frustrated trying to connect with someone who could help and had an ‘ah ha’ moment. Inspired by Uber, where I could see cars in the suburb, I wanted the same for beauty salons. The response from salons was amazing; the unique value proposition is a win-win and fills the gaps in appointments. The greatest achievement thus far is receiving repeat purchases from customers who enjoy the app. The same customers are coming back again and again, for different services, using Glamazon as their ultimate beauty concierge. I was also named one of Australia’s 27 emerging female entrepreneurs, which is so exciting and flattering, knowing all the hard work has paid off. Why do you think on-demand beauty appointments are going to be the new way of life? We are getting busier and busier, and we are so reliant on using apps for every aspect of our lives. Sometimes we can’t pick the phone up because we are busy, so booking an important appointment for a beauty service within three clicks is optimal in saving our time. Australia has experienced a cultural shift in the past year which has seen reliance on services such as Uber and Airbnb; we now accept how easy it is to connect one-on-one with a service provider safely and quickly. My style icons are Olivia Palermo and in Australia, Brooke Testoni. If I am ever in need of outfit or style inspiration before a night out, I always use Brooke Testoni’s Instagram for tips and vision. I also love the effortless look from Bella Hadid, she keeps it so natural with her makeup and highlights her best features. What do you predict will be the top beauty trends of 2017? I predict that 2017 will be a resurgence of the 90’s in terms of beauty and fashion trends. For nails, opt for a natural, manicured look, polish free and from a fashion beauty perspective people aren’t overdoing their makeup with false eyelashes, huge lips, dramatic eyes or contoured cheeks–instead keeping it a very natural glam. We’ll see more outgrown eyebrows and the revival of layering hair, rather than going for a bold snip. My goal is for Glamazon to be scaled across all of Australia as the ‘can’t live without’ beauty tool. We want to encourage as many salons and freelance stylists to join the Glamazon app and see Australians have access to beauty services within 20kms of their location. Our ultimate ambition is to expand Glamazon globally. On a personal level, I want to continue doing what I love, which is spending time with my friends and family. After starting Glamazon I am genuinely chasing my dreams every day, which is so fulfilling and brings me so much happiness, because I am doing what I love. I have the perfect balance between my work life and my friends and family, so I’ll just continue to strike that balance. Pictured: The brains and beauties behind the wildly successful Glamazon app, Lisa Maree and Lauren Silvers.